Human insulin degrading enzyme (IDE) plays a role in the proteolytic cleavage of insulin, glucagon, and other short, hydrophobic peptides with roles in glucose and cellular metabolism. Because of IDE’s role in insulin clearance, IDE inhibitors may hold promise as therapies for potentiating insulin signaling in patients suffering from type 2 diabetes mellitus. IDE is a large (~100 kDa) chambered protease of the conserved M16A subfamily of zinc metalloproteases. The enzyme adopts a structure that is analogous to a clamshell formed by the joining of the N terminal and C terminal domains. The characteristic zinc binding and catalytic motif (HXXEH) is positioned within the enzyme’s N terminus, while C terminal residues also play important roles in substrate binding and catalysis. 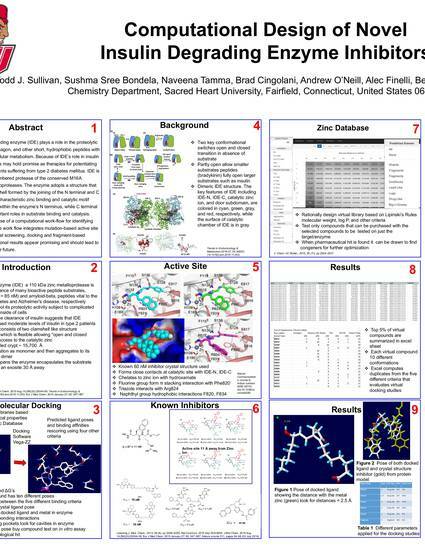 Here, we describe the use of a computational work-flow for identifying novel IDE inhibitors. The work flow integrates mutation-based active site structural analysis, virtual screening, docking and fragment-based design. Initial computational results appear promising and should lead to assay testing in the near future. Authors Sushma Sree Bondela and Naveena Tamma are graduate students in the Chemistry Department; Brad Cingolani, Andrew O’Neill , and Alec Finelli are undergraduate students.